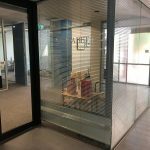 The other day our state Education Minister announced $72.3 million extra dollars will be spent over four years helping struggling secondary students, specifically kids who haven’t met Year 5 NAPLAN benchmarks. Woo hoo to that, I say. But if it’s spent on doing the same sorts of things that didn’t work in primary school, it will be a waste. 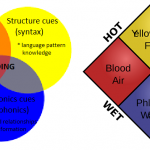 Secondary school students with poor decoding skills and very little ability to spell generally need a good initial blast of synthetic phonics to build their awareness of sounds in words and knowledge of spelling patterns, followed up by work on vocabulary, comprehension and fluency. I’ve been doing this type of work for 14 years, in conjunction with the world’s most fabulous integration teacher and aides. 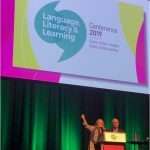 We’re yet to find someone we can’t teach to read, including students with intellectual disability, language disorder and English as a second or third language. Here’s roughly what I’d do and buy if I were a decision-maker in a secondary school with a number of students who have encoding/decoding difficulties. Many of the targeted students will already have had quite a bit of assessment, indicating that their primary problem is getting words on and off the page (encoding/decoding). Poor reading comprehension, because they can’t get the words off the page and thus also lack reading experience. Spoken language and other skills in the average range. Sometimes a student’s spoken language or other nonverbal skills are below average, but to be attending a mainstream secondary school they can almost certainly learn to encode and decode, it will just probably take a bit longer than for other kids. Reports about the above assessments don’t usually include details about the tin tacks of what kids can and can’t do with sounds and letters. They don’t answer questions like: can they segment a three-sound word? A four or five-sound one? Can they blend sounds, and if so, how many? Are there sounds they get mixed up? Do they know any consonant or vowel digraphs or longer spellings? If so, which ones? Do they know how to break words up into syllables? 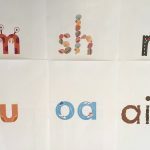 This sort of detail is needed to work out where to start teaching, and requires further assessment by someone with expertise and experience in both synthetic phonics and working with demoralised teenagers. Most teenagers with poor literacy think they CAN’T learn, so persuading them to participate in another round of assessment because you’re pretty sure they CAN is often tricky. If you’re in Victoria and want me to help with this, let me know. Free tests available from MOTIF can help with both pre-programming assessment as well as getting an updated baseline, if other test results are not recent. A test like the York Assessment of Reading Comprehension (Secondary) can also be useful if you don’t already have enough baseline information, if the student can read a bit. But some kids can’t even attempt the simplest passages on this test, so there’s no point putting them through it. 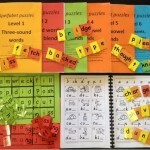 Speech Pathologists, Special Education Teachers and other professionals with expertise and experience in explicit, systematic synthetic phonics are more expensive than aides, so ideally should be working on assessment, planning intervention, providing work for students and training for aides, checking progress, answering questions and modifying the program accordingly. Older students need at least an hour/period a day to make fast progress – one or two sessions a week is simply inadequate. Louisa Moats recommends about 90 minutes a day if you’re aiming for catch-up, not just improvement. Remember that peers are also improving their skills all the time. Many mainstream secondary classes are often a demoralising experience for students who can’t read and write. Teaching them to read and write so they can participate has to be top priority, though wherever possible they shouldn’t be taken out of classes they enjoy and in which they can participate and succeed. Once the overall literacy goals and direction are set and materials are provided, the bulk of the day-to-day work with students can be done by aides, with a weekly joint session with the professional overseeing the program. Wherever possible, students should work in pairs or small groups, because it’s more efficient, more fun and because a bit of competition can mean a lot more work gets done. Having said that, sometimes there’s only one student who needs a particular program, and some students’ anxiety levels or difficult behaviour make it necessary for them to work alone. 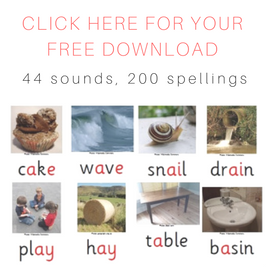 There are some great materials available to teach teenagers phonemic awareness and spelling patterns, as well as targeting their vocabulary, comprehension and fluency. The Rip Rap books and Teacher manuals. I only have Set A, but have found that kids love them, they have slapstick humour, farting camels etc. so I’d probably get both sets. 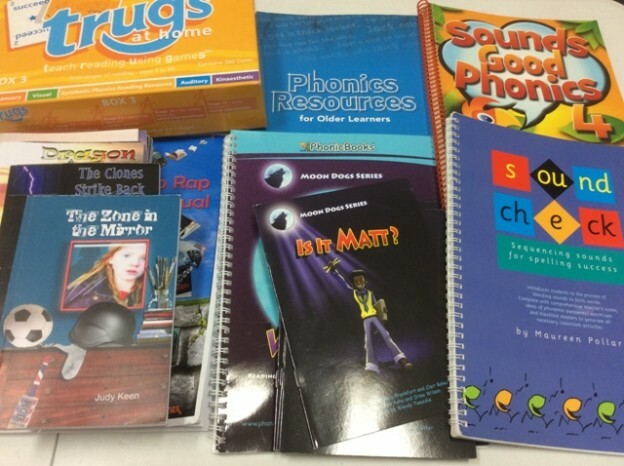 The Phonic Books readers and workbooks for catch-up students: Moon Dogs, Magic Belt, Alba, Totem, Talisman and/or Rescue series, depending on the number and skill level of students in the program. All three boxes of TRUGS card games. If there are only a few students on the program, the Home Boxes are probably enough, but in larger programs a School Box would be better. That Reading Thing (I haven’t used this, but it looks great online). My own Spelfabet Comic Sans kit of workbooks, games and other materials, which are pdf downloads you print yourself. Apps are great to offer as an extra activity in a pair or group if one student finishes well ahead of others. I know some of the names of these apps sound like they’re not suitable for teenagers, but they aren’t full of teddybears, and I provide the above list on the assumption that you will check out materials yourself before making a decision about which student will be offered what. I’m sure some readers will have additional suggestions of great materials to use with teenagers, or thoughts on some of the above materials, so please if you do, leave a comment. 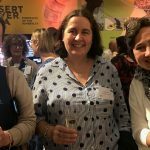 This entry was posted in assessment, books, curricula, funding, literacy problems, phonics activities, phonics games, teaching strategies on September 17, 2015 by alison. Thanks for this comprehensive list – very useful – this is exactly what my school needs – thanks so much for sharing! Alison – my teenage daughter needs help desperately. We have tried many things but her reading comprehension is very weak. She is in year 9 – just got her NAPLAN results and is in Band 5. Do you live in Sydney? Could you help her?